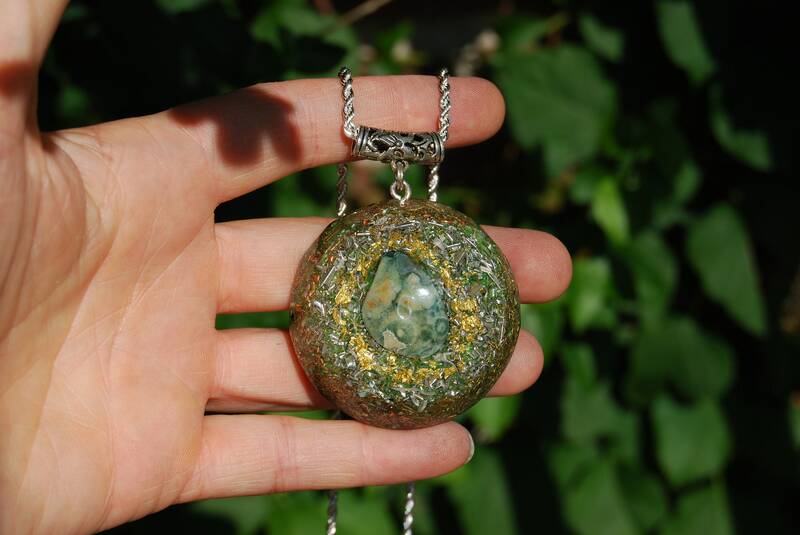 This large 4.7 cm / 1.85" in diameter Orgonite® pendant is made out of lots of brass, aluminium, copper shavings and 24K leaf Gold. 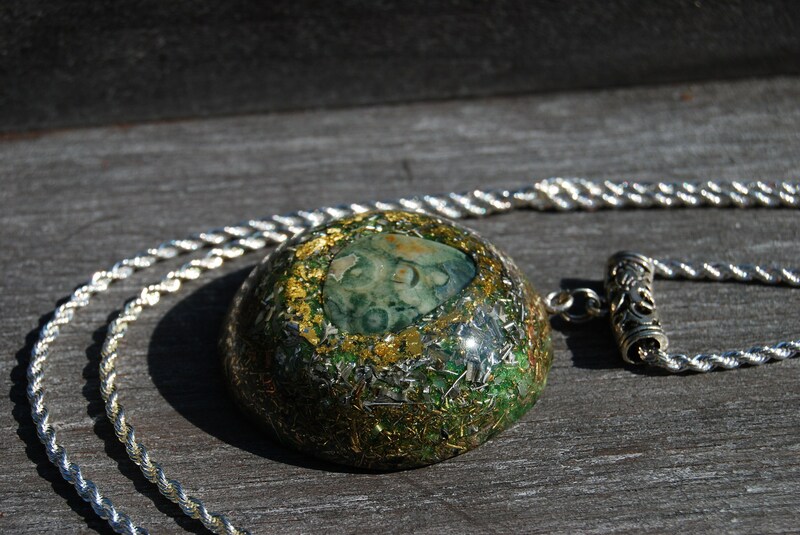 The main stone is a green Ocean Jasper in the front. Furthermore it contains Rose Quartz (self - love), Tourmaline (protects and grounds excess energy), Shungite (protect), Pyrite (to enhance and protect), Shungite ( Rhodizite (to amplify), Selenite (to clear and charge) and a terminated clear quartz (for piezo-electric effect) all within a durable resin setting. 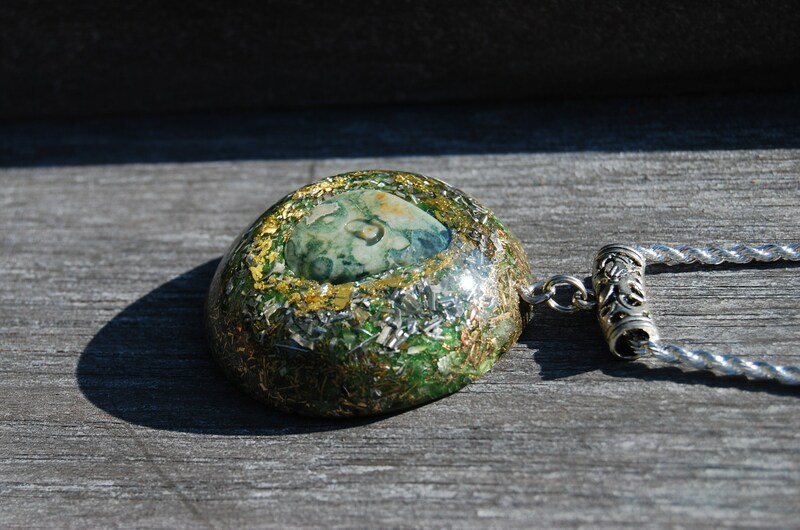 Ocean Jasper is distinguished by its orbicular green and cream patterning and is also known as Orbicular Jasper. 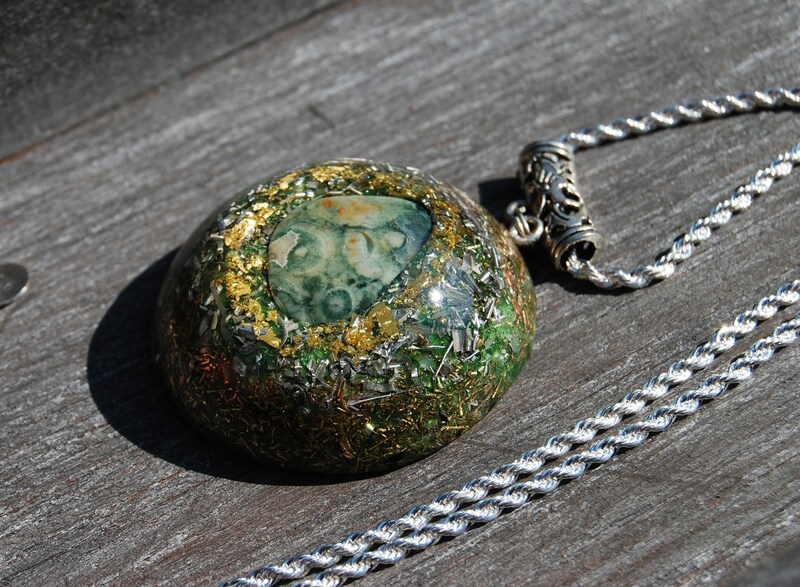 Beautiful Ocean Jasper is only found one place in the world, Madagascar. 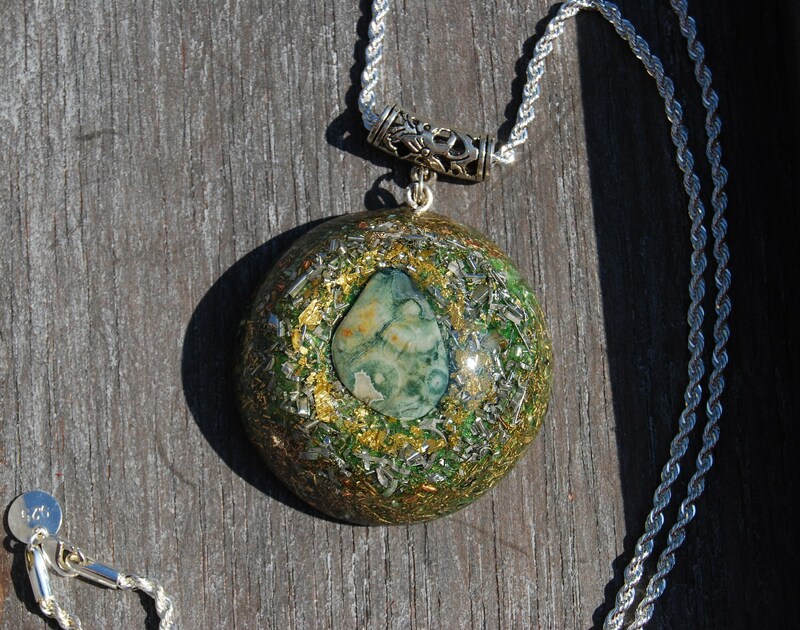 There are only a few deposits on the island and many deposits can only be reached by boat, making ocean jasper a wonderfully rare stone. 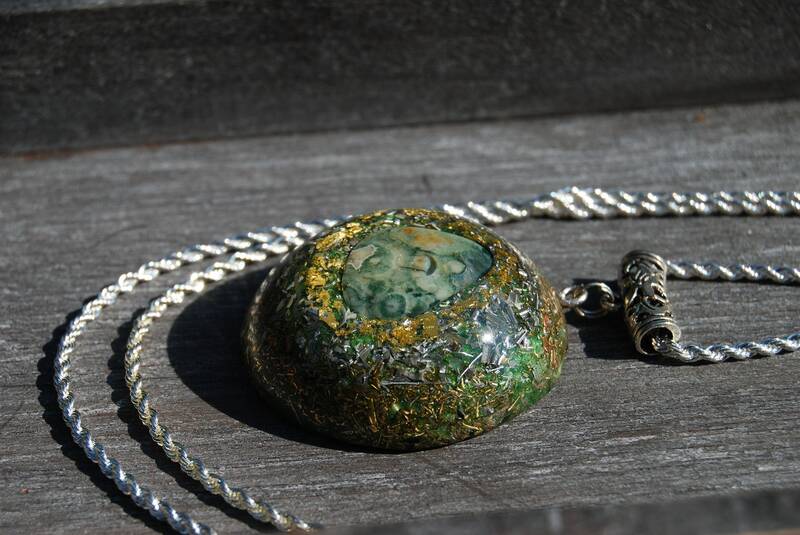 Like all Jaspers, Ocean Jasper alleviates stress and induces tranquility. Its cleansing effect eliminates negative energy and stabilizes the aura. It comes on a thick 22 inches/56 cm 925 sterling Silver plated necklace. 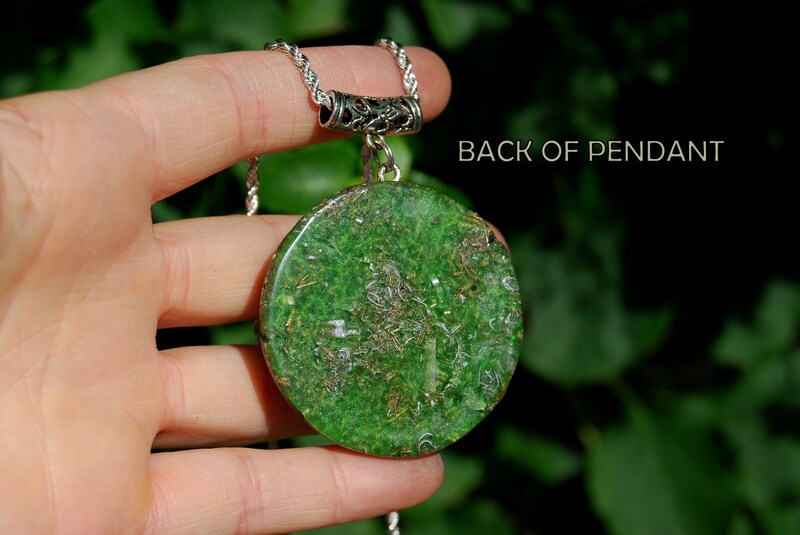 This pendant is absolutely stunning and just as described! I bought it as a gift and I hope the recipient loves it as much as I do. 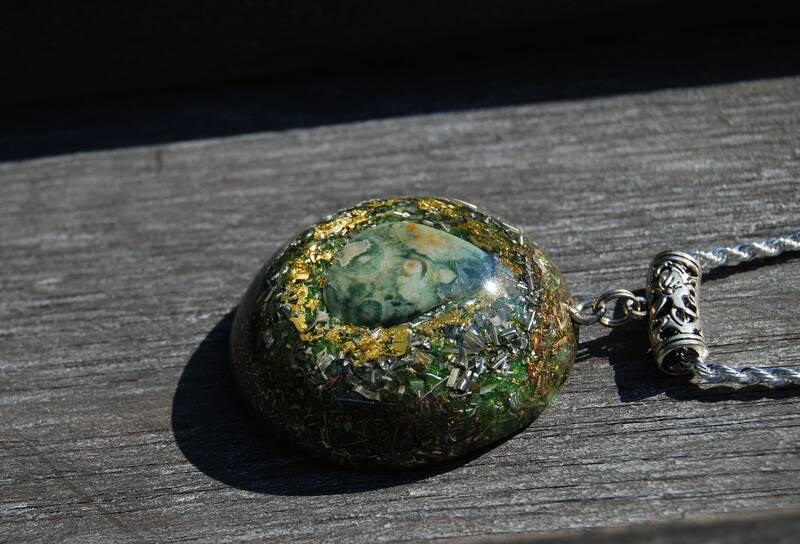 I bought multiple items from this shop, 3 other necklaces just as beautifully crafted as this one and some orgonite generators. I noticed one night that I was coming down with a very bad headache. I layed down with my necklace on and put the orgonite on the center of my temple. Within twenty minutes my headache was gone! This was really an amazing thing for me because I have had chronic headaches and I've felt for some time that it could be where I live (high emf traffic!) I'm looking forward to feeling the difference now that I've placed the orgonite generators in all areas of my home. The shop owner was very easy to talk too and highly responsive. Thank you Zoe! I will be back!